Typically served around Christmas and other holidays, this sweet treat is a must for honey lovers, as honey is incorporated into the recipe and drizzled on top. Boil first 3 ingredients for 10 to 15 minutes. Keep on a low burner until ready to use. Add flour slowly, kneading lightly. Add 1/3 cup oil and mix well. Separate dough into five sections. Keep unused portion covered to keep from drying. Roll out each section like rolling a pie, thin. With pastry wheel or paring knife, cut into strips 2 inches wide and the length of the pastry. Roll on a fork to form circle*. Heat oil in a fryer. Drop into hot oil. Remove when the dough is light brown and puffed. Drain on paper towels. Dip in reserved hot syrup; sprinkle with cinnamon and nuts. 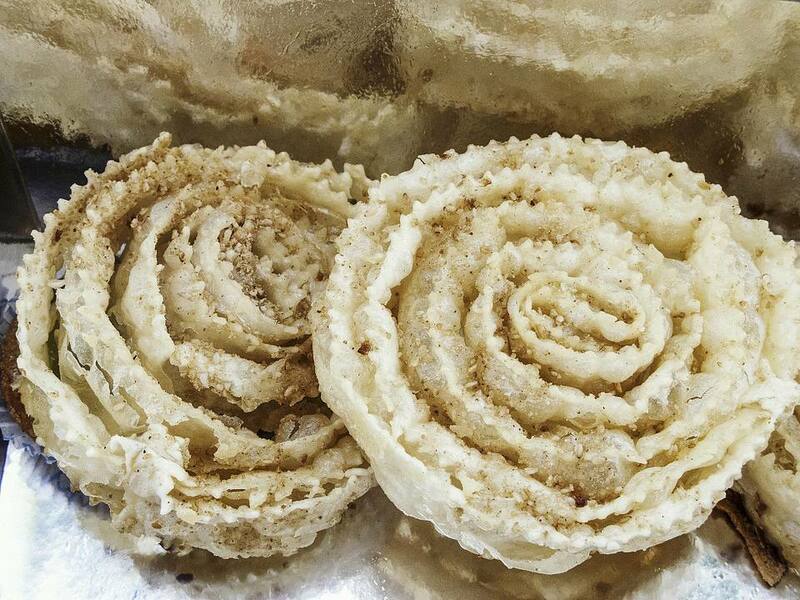 The dough strips are sometimes formed into circles with 2 forks after they are put in the hot oil.